Elizabeth Harper of the All the Saints You Should Know blog recently published a fascinating piece on the “Incorruptible corpses” of the Catholic Church. It reminded me of Saint Vibiana, who is resting comfortably in downtown Los Angeles and has had a fascinating journey of her own. Vibiana died in the year 250 and her tomb was reopened in Rome in 1853. According to historian Bobb Edwards, her remains were covered in wax and sent on an eight-month boat ride to Peru, New York, San Francisco, and Monterey, finally arriving in Santa Barbara in 1861. Fifteen years later she was moved to a glass box above the altar of the newly built Cathedral of Saint Vibiana at 2nd and Main downtown, where she spent the next 120 years. Following the Northridge earthquake, the saint made a temporary stop at Calvary Cemetery in East Los Angeles, and the cathedral was rebuilt as a fun party palace. 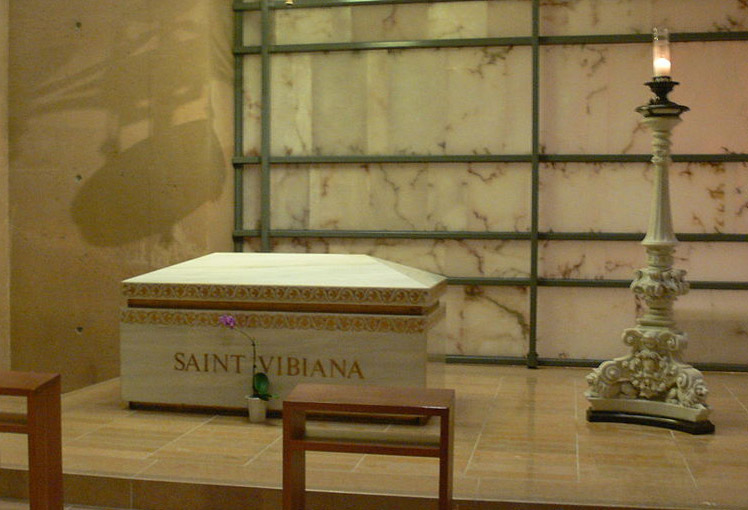 Miss Vib returned downtown in 2002 where she remains in an underground marble shrine at the Cathedral of Our Lady of the Angels. Fame is fleeting, though: the new cathedral was named after a more well-known religious figure, and Vibiana’s remains were relegated to the basement. Drop by and say hello sometime.